This tightly edited volume opens a new vista in psychoanalysis by focusing upon positive and life-enhancing emotions and attitudes. The realms it covers include love, friendship, enthusiasm, courage, tact, resilience, and forgiveness, among others. Seminal papers on these topics have existed but remain scattered throughout the psychoanalytic literature. This book brings them together in a harmonious gestalt. It is more than an anthology, however. Each paper is followed by a freshly written commentary that critically evaluates the paper and brings it in consonance with up-to-date, contemporary psychoanalytic knowledge. 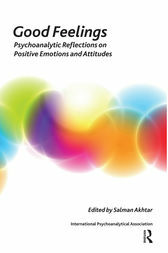 Issues of development, adaptation, psychopathology, and analytic technique, as these pertain to the positive dimension of affective experience, are elucidated. The book also deals with the broader and overarching issue of the 'goodness' that accompanies, causes, and is enhanced by the positive emotions in consideration here. Thus the ever-elusive and puzzling issue of psychoanalytic morality finds a place in the discourse, with all its rich and complex theoretical and technical implications.